I’m not even entirely sure what I mean there, but let’s just roll with it. Can you believe it’s THANKSGIVING WEEK? (all caps mandatory) I cannot. Just cannot. We leave in the morning for our our annual trip to Fayetteville, where we’ll see frans and fam, but backwards, flipped and reversed. I am SO excited. But for today (!! ), let’s eat some burgs, man. I wanted to throw in a semi-not-thanksgiving-style-in-a-way-kind-of meal, but still stay in line with the time of year. 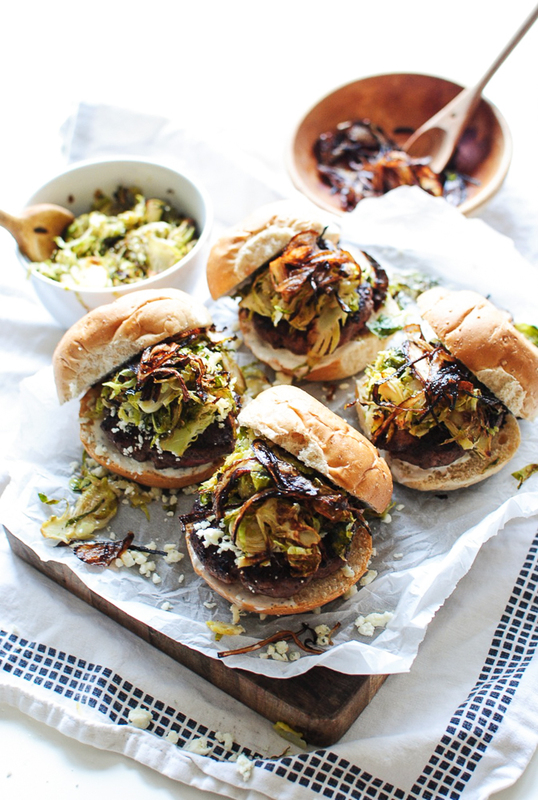 With that in mind, we’re propelling piles of brussels sprouts into our faces. Woo hoo! Don’t get mad. They’re shredded. And roasted. 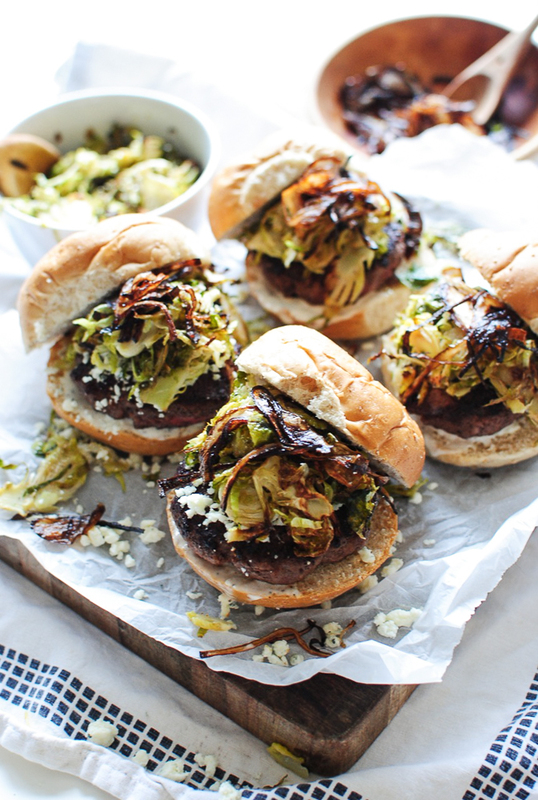 And piled hiiiiigh on a spectacular grass-fed beef burger. GUH, so insane. This meal, while looks a bit laborious, is seriously very very simple in technique. I did NOTHING to the beef, other than salt and pepper. I did MINIMAL to the brussels, just a quick mandolin (add it to your wish list already!) slicing action, and a roasty jaunt in the oven. I did VERY LITTLE to the shallots, with only a quick dip in some hot oil. Add a little bit of ranch dressing to your bottom bun, and a lot of crumbled blue cheese to your burger patty, and your new life awaits you at your mouth gate. Open your mouth gate. Open it. Can I just interject here real quick to tell you a quick, painless, mini story? Wait, you’ve had your flu shot, right? Just kidding. So, I ordered these pimp duck boots on Amazon last Friday, using my prime membership, right? Because see, it’s going to rain THE ENTIRE time we’re in Arkansas, and home girl needsa be prepared. And while I’m irrationally obsessed with my Hunters and will never ever quit them, I wanted a little change in foot scenery, you know. So like, they’re supposed to arrive TODAY, GUARANTEED by 8pm tonight. But they still haven’t shipped! But check this, the little bar is aaaaaaaall the way over close to the delivered mark, and the status is “ON TIME, ARRIVING TODAY BY 8pm” but it also still says “shipping soon.” You guys, this is giving me massive, herculean anxiety. Do I need to write the seller? Live chat with Amazon? Sell my liver? Wash my hair? HELP. I think these would be completely awesome with your T-day leftovers! Maybe add some cranberry sauce? Some stuffing? Seriously, just go wonk bonkers with them, for the love. Divide the beef into 4 large meatballs, then press into patties. Sprinkle with salt and pepper on both sides. 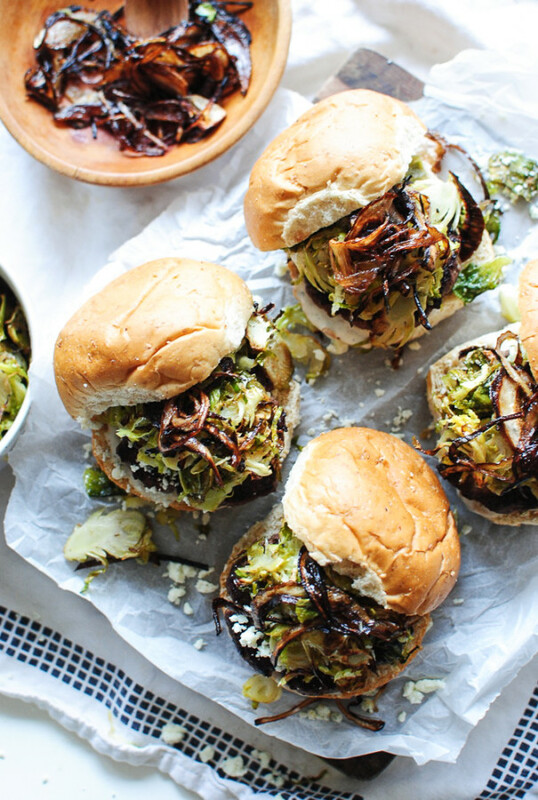 Either cover and chill in the fridge for a bit (the burgers, not you), or start cooking. 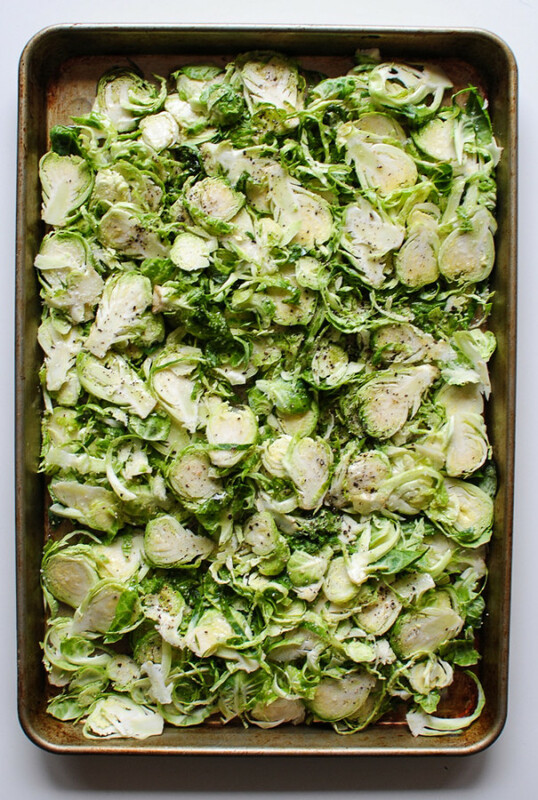 Arrange the sliced/shredded brussels on a large baking sheet in an even layer. Drizzle with olive oil and toss with a good pinch of salt and pepper. Roast for 30-45 minutes, until darkened and slightly caramelized all over. Bring a skillet to a medium-high heat. Add the burgers and sear on one side for 5 minutes. Flip and sear another 4-5 minutes, until cooked through. Transfer to a plate to rest a few minutes. In the meantime, bring 2-3 cups of vegetable oil to a high heat in a small pot. Add the shallots in batches, frying until brown. This should only take like 30 seconds! If you have a favorite shallot-frying method, go for it. I just dipped mine in, got them good and brown, and took ’em out. The end. Lightly coat the bottom burger bun with ranch dressing, then place a patty on it. 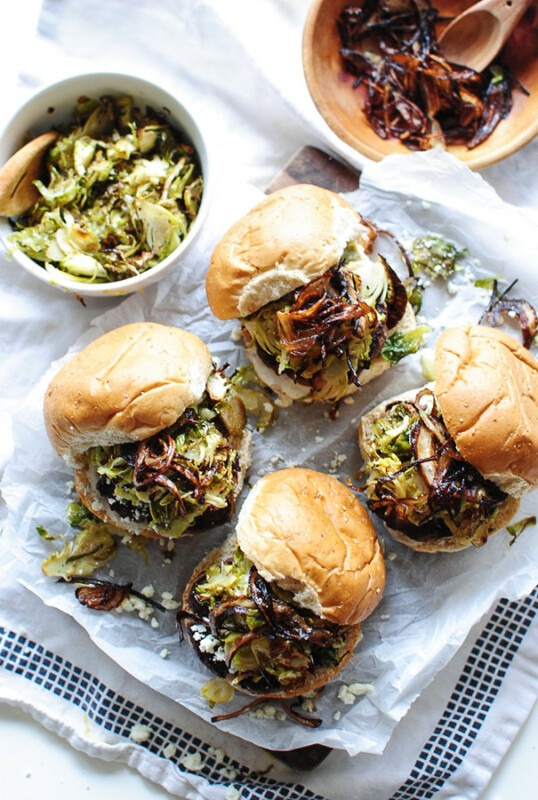 Top with blue cheese crumbles, lots of good roasted brussels, and a few crispy shallots on top! Get in that. I hope you have a most gobble-licious holiday! I’m taking the day off Thursday, but will be back to ritually annoy you with Friday Flotsam at the end of the week. I am in love with brussels, like I want them all the time. This looks fantastic! I wouldn't worry about the Amazon order. I have some Prime orders that I received months old that still say they are "On the Way". I'm sure it will show up! P.S. The burgs looks phenomenal! God you've done it again. Those burgies are da bombies. I'm obsessed with brussels sprouts lately (never liked them growing up) and I need to shred some and get on the brussels bandwagon. Was going to ask you how you do it but yes, I need a mandolin slicer. I wonder if you can just cut them thin? Because I have to many "things". Why do we seriously always have to have these internet web catastrophes happen RIGHT before trips?! That crap only happens when I NEED something to arrive on the day it is supposed to arrive. I hope they arrive!!! I am feeling anxious vibes alone with you *fist pump*<---I don't know why. Oh I am totally putting a mandolin on my Christmas list! 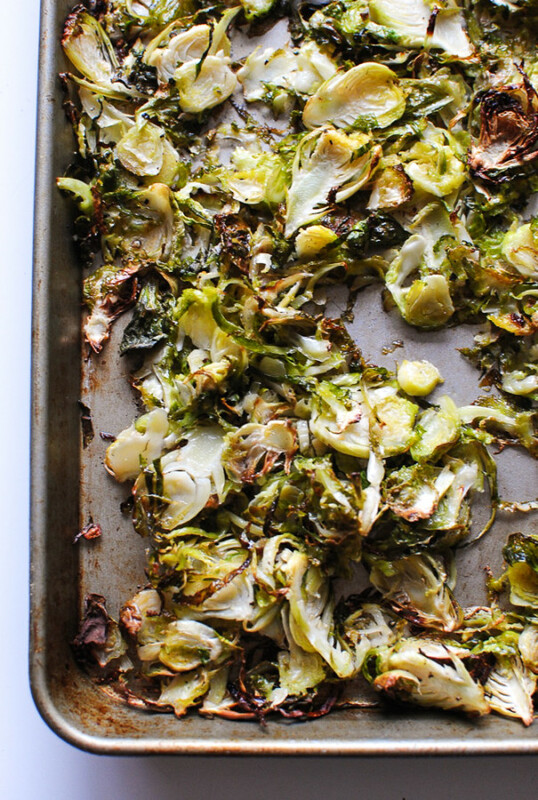 I didn't know you could slice up and roast brussel sprouts like that. I love how these look like pac-man burgers. Except pacman has a mouth full of crispy blue cheese deliciousness. Hey Linda, Don't buy an expensive mandolin. Look up Cook's Illustrated on the internet and see which one they recommend. I'm guessing it will be OXO. Happy Olliedays'! 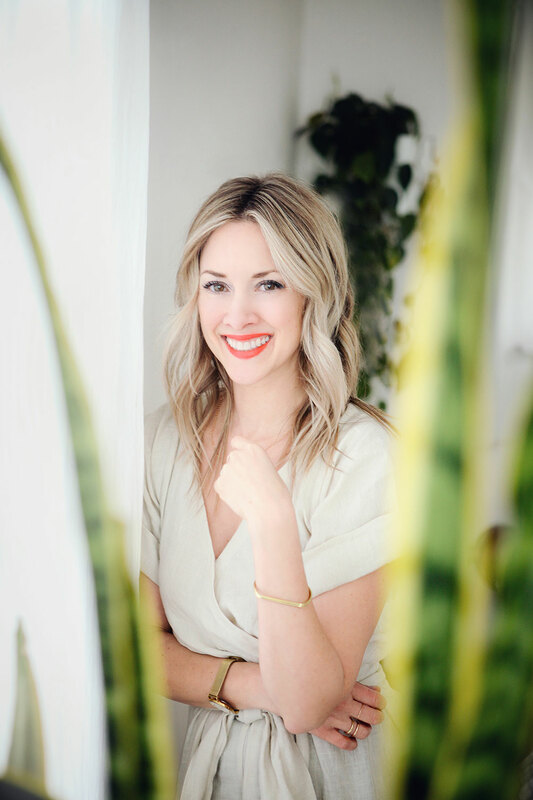 Discovered this recipe when it was featured on Shutterbean's "I love lists Friday!" this week, and made it last night for dinner. YUMM-O!!!! Especially in love with the roasted brussels sprouts. Thanks! Oh, I am so hungry right now! 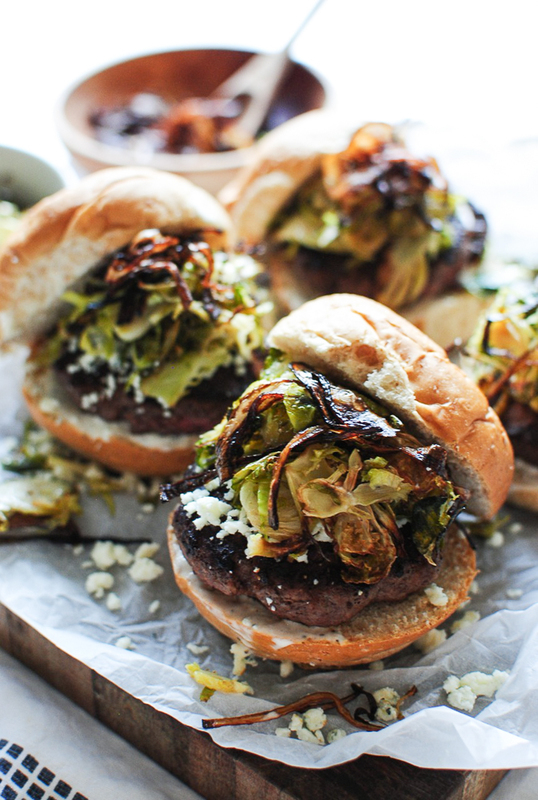 These burgers are perfect! I was searching for alternative burgers because I am not a fan of salads, sauces and french fries.